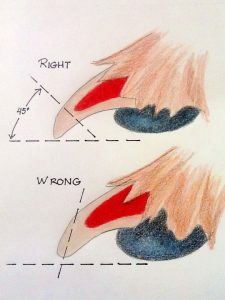 Trimming your Cavalier King Charles Spaniel’s nails isn’t difficult and can easily be done at home. You’ll have greatest success in the long term, however, if you start slowly and help your pet learn to associate nail trimming with a positive experience. Your dog’s nails consist of an outer insensitive shell which protects a small blood vessel and nerve endings inside. If your pet’s nails are light colored, it will be relatively easy for you to the pink area where the blood vessel begins. If your dog’s nails are dark colored, use the bend or hook in the shape of the nail as a guide and clip off only a little of the nail tip at a time. Particularly if your Cavalier Kent Charles is a puppy, you’ll want to start by familiarizing your pet with the idea of someone holding his paws. Gradually extend the length of time your Cavalier will sit patiently while you hold his paws, and begin to touch his nails individually. Be sure to buy a good quality pair of nail clippers at your local pet store. Allow your pet to see and smell the clippers before attempting to clip his nails. Once your Cavalier becomes bored and disinterested in the clippers, you can start your first nail clipping session. If your pet’s jumpy, then ask a friend to help hold him while you clip his nails. If clipping your Cavalier’s nails without assistance, place your pet in your lap, facing away from you. Push back the hair around the nail so you can see clearly as you hold his paw in one hand and use the clippers in your dominant hand to trim the nail at a 45 degree angle. Trim a little bit at a time, rather than making one large cut. It’s also handy to have a small jar of styptic power on hand in case you do cut into the “quick.” You can also use corn starch as an alternative. If your dog’s nail begins to bleed, press the nail into the powder for a minute or two to clot the bleeding safely. How often should I trim my Cavalier’s nails? If you walk your pet on hard surfaces (e.g. paved roads & sidewalks), your dog’s nails may wear down on their own. If, however, you can hear your dog’s nails clicking against the floor or pavement when he walks, it’s definitely time for a nail trimming session. Trimming your dog’s nails is important to their health. Long, untrimmed nails affect your pet’s posture and can cause pain and discomfort if not attended to on a regular basis. Tips for Better Nail Care from Life’s Abundance on Vimeo.